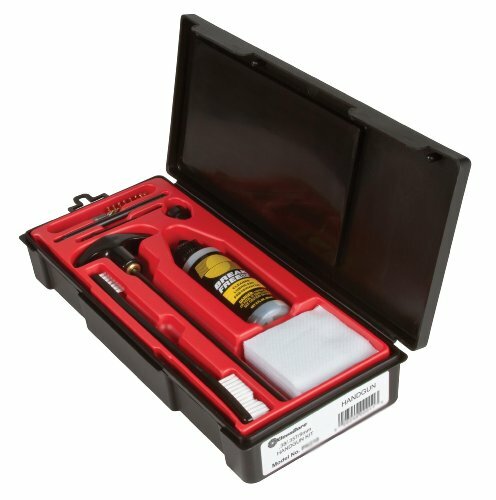 The Kleenbore Classic Cleaning Kit include two working rod sections, both of which are threaded to accept all standard accessories. The swivel handle section will clean up to a 7" barrel, and with the 2 3/4" rod extension, handle up to a 10" barrel handgun. Handgun Cleaning Kits. Steel 10" rod with swivel handle. Accessory adapters. Double-ended nylon bristle gun brush. Phosphor bronze bore brush. Slotted patch holder. 2 oz. Formula 3 Gun Conditioner. 100% Cotton cleaning patches. Silicone gun and reel cloth. If you have any questions about this product by Kleenbore Gun Care, contact us by completing and submitting the form below. If you are looking for a specif part number, please include it with your message.